Reheat (in the oven) crescent rolls and place cheese on roll first so it melts. Then place turkey in roll. Mix together yogurt, dijon mustard and sprinkle of pepper. Spread on turkey. After plopping down on the couch in a post-Thanksgiving food coma, the last thing anyone thinks about is more food. But, unfortunately, there's still the dreaded question: What to do with all the leftovers? Thanksgiving leftovers can be great party appetizers for potlucks, or just hanging out with friends after the fam's gone home. A delicious and different way to use leftovers are these Next Day Bite Size Turkey Sandwiches. I like to stick with the always-delicious classic of turkey sandwiches. Relish the fact that instead of plain Jane grocery store turkey, you are looking at moist, juicy, roasted-for-hours holiday bird. A blah turkey meal? I think not. 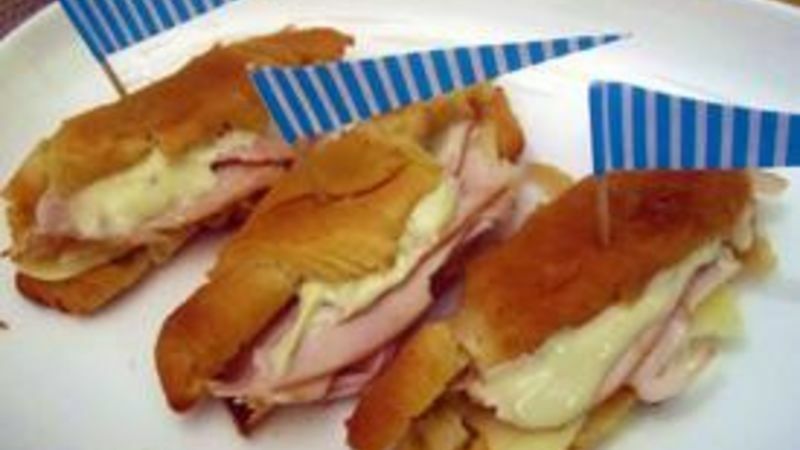 I use Pillsbury Crescent Rolls for my Next Day Bite Size Turkey Sandwiches. Flaky, light and deliciously buttery, these rolls are always present at my Thanksgiving table. And their petite size makes them perfect for a delicious, bite-sized leftover sandwich. Use them to feed the motley crew still staying at your house (seriously, will they ever go home? ); as a protein-packed snack for Black Friday’s shopping frenzy; or as a quick appetizer for your after-Thanksgiving gathering. If you’re lucky, you will be eating turkey and cranberry sauce all the way to Christmas! Gobble-gobble! Here are great recipe ideas to put your leftovers to good use.